Successfully Added DIY Oscilloscope Kit 15001K - 1Msps, 2.4 inch TFT LCD, 20mV/Div to 5V/Div Sensitivity, 200KHz Bandwidth to your Shopping Cart. An oscilloscope is a fundamental tool for every electronics engineer and hobbyist, this DIY oscilloscope kit bring the electronics enthusiast the pleasure and reward of making their own oscilloscope and comes with the full complement of surface mount components required as well as step by step directions to solder them all in place. It is recommended that users have good soldering experience and knowledge of PCB assembly, however the comprehensive step by step instructions accompanying the kit have full color photos and the easy to follow directions will walk you through the assembly, so it takes a minimal amount of time to make your oscilloscope. 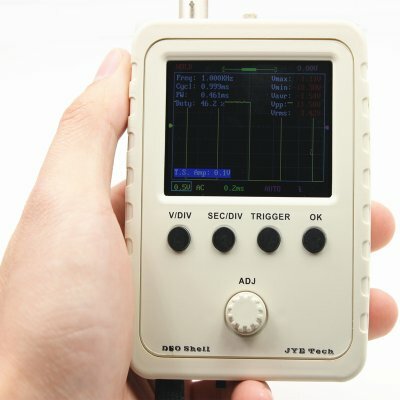 This portable oscilloscope kit has all the basic features with the bandwidth being from 0 to 200KHz, with sensitivity ranging from 20mV/Div to 5V/Div. The maximum real time sampling rate of 1M samples per second, 12-bit resolution and take a maximum 50Vpk input. You will need a standard set of tools to assemble this kit including a solder iron, solder wire, digital multi-meter, small phillips screwdriver, flush cutter tweezers, needle nose pliers and DC 9V power supply. Whether you're a professional engineer or a electronics enthusiast this DIY oscilloscope kit will bring you the reward of making your very own portable oscilloscope. This kit makes a perfect educational tool and is an ideal way to inspire and captivate young minds while teaching them invaluable engineering skills. The 15001K DIY oscilloscope kit comes with 12 months warranty, brought to you by the leader in electronic devices as well as wholesale cool gadgets and electronic tools.. It is assumed that users have adequate soldering skills and troubleshooting skills to assemble the DSO Shell kits. Arabic: - الذبذبات المحمولة - Chinese Simplified: - 手持示波器 - Czech: - Ruční osciloskop - Danish: - Håndholdt oscilloskop - Dutch: - Draagbare oscilloscoop - French: - Oscilloscope de poche - German: - Handheld-Oszilloskop - Hebrew: - אוסצילוסקופ כף יד - Hindi: - हैंडहेल्ड आस्टसीलस्कप - Italian: - Oscilloscopio palmare - Japanese: - ハンドヘルド ・ オシロ スコープ - Korean: - 휴대용 오실로스코프 - Malay: - Oscilloscope riba - Norwegian Bokmål: - Håndholdt oscilloskop - Romanian: - Osciloscop portabil - Russian: - Портативный осциллограф - Spanish: - Osciloscopio portátil - Thai: - มือถือขด - Turkish: - El osiloskop - Vietnamese: - Máy hiện sóng cầm tay.